SsangYong Blenheim Palace International Horse Trials have wrapped up in the UK, with Australian combination Amanda Ross and Koko Popping Candy (Zarzy) finishing 10th of more than 100 starters. It was a fantastic effort by the Australian WEG reserve combination. Amanda was the highest placed international rider, with the 9 riders above her being British. It was Bella Innes Ker and Carolyn who won the class on 28.4, with William Fox-Pitt and Oratorio II in 2nd on 28.7 and Alexander Bragg and Zagreb in third on 29.6. After stretching Zarzy’s legs on a relaxing post Blenheim hack, Amanda happily reporting that Zarzy is feeling a million dollars. 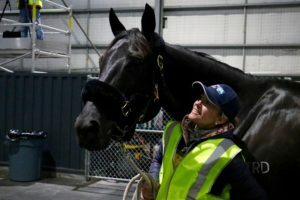 Team Ross will leave for Germany to join Shane Rose’s Virgil in quarantine, to get ready to fly home to Australia with EIAF.